When I give readings nowadays, I ask people to give me their impressions of some of the cards that I pick for them, before I offer my own interpretations. This does several things; it gives the person asking for the reading direct insight into their situation and it also and very importantly, leaves the power in their hands. These personal impressions of the cards give me a fresh look at the cards’ meaning and a new perspective on the question that I am being asked. Sometimes I think that a reader (certainly this is true for me) can have set meanings for the cards fixed in their minds. In one way this is good, as it enables the reader to gather the information from the symbols rapidly and deliver a helpful reading. 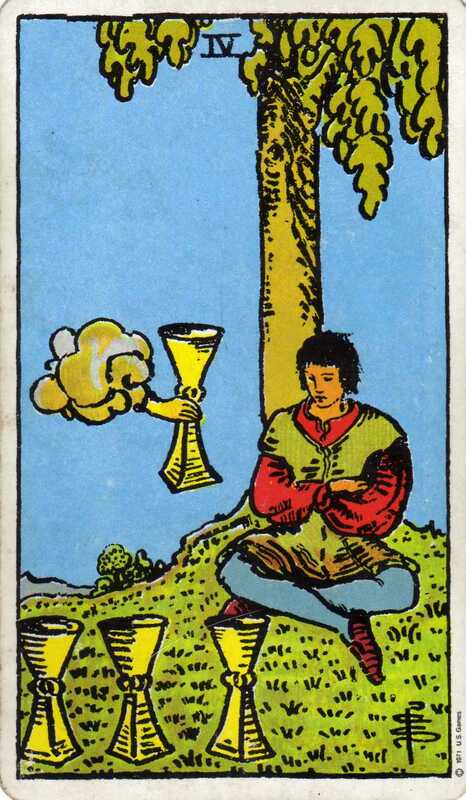 On the other hand, having fixed meanings for the cards brings a certain rigidity to the interpretation . So I offer the following exercise: If you are not familiar with the cards you will learn something about them from doing this. If you are familiar with the cards, this will give you fresh insight and a new perspective. Sometimes gaining a new perspective doesn’t take much at all – simply a step to one side. Look at this card for a few minutes, without preconceptions and with an open mind. Open notepad or write on a piece of paper and jot down the impressions that you receive from this card. How do you feel when you look at the card? What do the symbols say to you? How would it feel to be the man in the card? Put yourself into the picture for a few minutes; feel the grass, the air, the tree trunk against your back. What are the cups made of and what is inside them? Are you aware of the other cup that is being offered? What does it contain? Please feel free to leave your impressions as a comment below this post. I am going to do this right now too and I will leave mine on my Impressions Page. Don’t be tempted to look at mine till you have done the exercise yourself. If you would like to learn more about how to develop and use your intuition, click here to subscribe to the bi-monthly Intuition Development Newsletter ‘INTUITIVE’. Each subscriber is automatically entered into a draw for an Email Tarot Reading, the winner will be announced in the Newsletter.